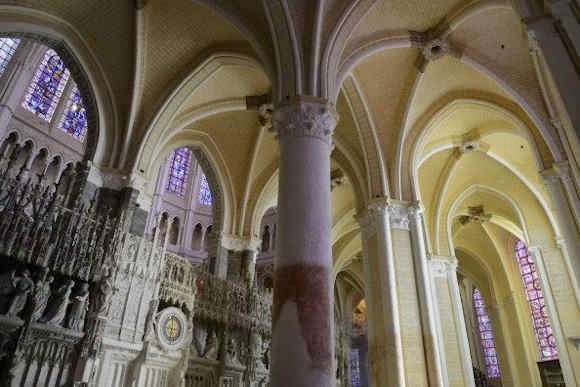 Concern on the repainting of the Chartres Cathedral was first raised in the Spectator on 12 May 2012 (Restoration tragedy ~ Alasdair Palmer questions the ill-conceived makeover of Chartres cathedral which robs us of the sense of passing time that is part of its fascination and mystery). 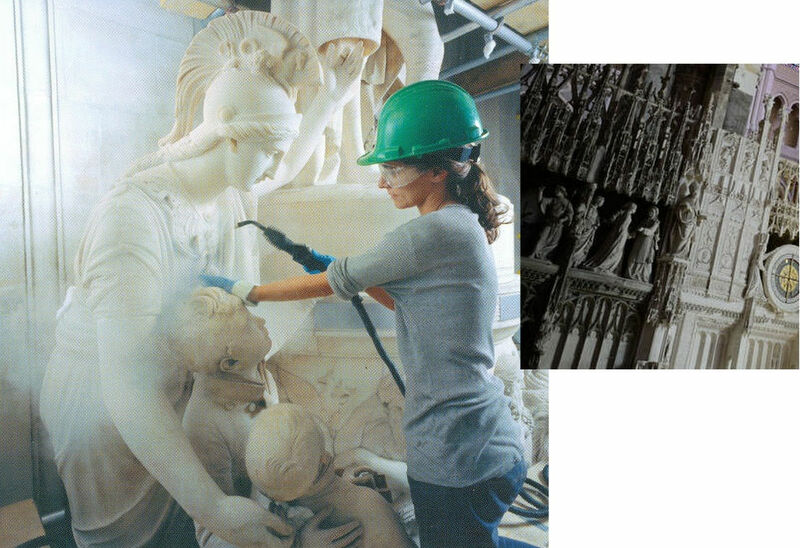 The contempt for history in Grandiose Conservation Projects is as much a constant as their high costs. 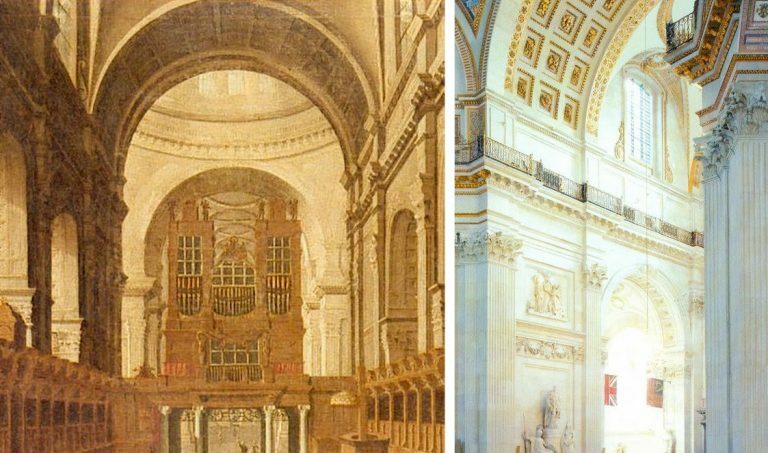 Against the estimated $18.5m at Chartres the whitening at St Paul’s Cathedral (inside and out) cost £40m. 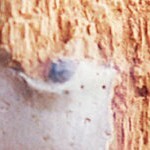 Self-evidently, major transforming restorations serve substantial vested material and professional purposes. They also take place in economic and cultural climates. The now long-running attempt to create a United States of Europe is an economically and politically failing enterprise. As manufacturing jobs flee the continent and democratically elected governments are replaced by bureaucrats, make-work schemes in the cultural sector are finding great favour as a means to stimulate compensatory economic growth. Not only do such grand and labour intensive restoration schemes make jobs for their duration, they stimulate tourism which is now one of the world’s greatest industries. In addition to boosting tourist revenues, another benefit of major restoration projects is that they continue to make work further work down the line. 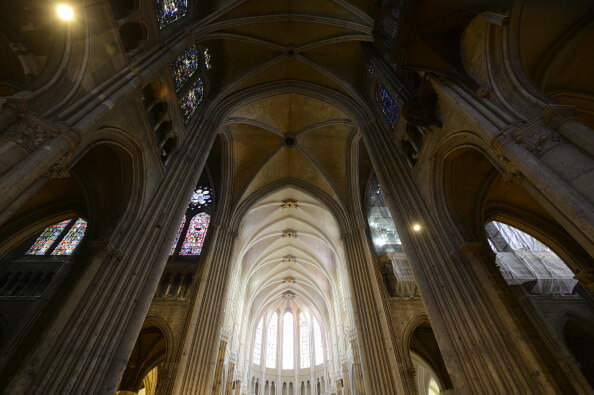 At Chartres, the interior was untreated for 800 years but its new and speculative livery will rapidly go dingy and need re-doing every twenty or so years. 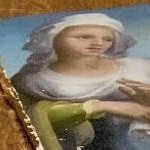 As we have recently seen, within twenty years at the Sistine chapel, urgent restoration measures have been carried out (in part in secret) because Michelangelo’s frescoes are physically disintegrating following the destruction-by-restoration of his final coat of secco painting. As for the resulting over-bright “restored” colours, to compensate for their already fading appearance, a new, immensely brighter artificial lighting system (with thousands of LED lights) has been installed. As the great “conservation” merry-go-round goes round, lightening, brightening, physically undermining and aesthetically falsifying, it is becoming increasingly necessary for those concerned for the integrity of our common artistic heritage to join the dots and to “follow the money”. This even further compounds the damage done during the horrid “restoration” of the stained glass. Instead of doing the proper thing and sandwiching the original glass between protective layers of modern clear glass and re-leading the windows, the original glass was impregnated with some acrylic which filled in all the tiny irregularities that gave the original glass its famous quality. Bear in mind that the leading naturally deteriorates and needs to be re done every so often (like replacing deteriorated stonework)…..so none (if any) of the original medieval leading is there anyway. 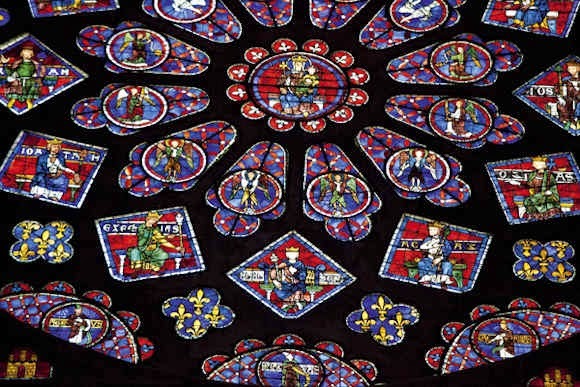 The result of the glass ‘restoration’ was to give the appearance of a garish plastic reproduction of the originals. This impregnation with the offending plastic may never be able to be reversed. Michel Favre-Felix, President of ARIPA (Association Internationale pour le Respect de l’Intégrité du Patrimoine Artistique), has drawn our attention to his own study of the earlier and underlying stages of this policy. An account of those researches was published in his article of Nuances 40-41 (2009). We are deeply indebted to Mr Favre-Felix not only for conducting those initial studies so thoroughly and for demonstrating their unsatisfactory – if not sinister – character, but also for presenting them here in summary form. Since 2003, the declared ambition of the European Commission has been to “facilitate”, “encourage”, “promote” and make “easy” the “mobility of art collections” within Europe. To this end, five conferences were held in Naples (2003), The Hague (2004), Manchester (2005), Helsinki (2006) and, Bremen (2007). 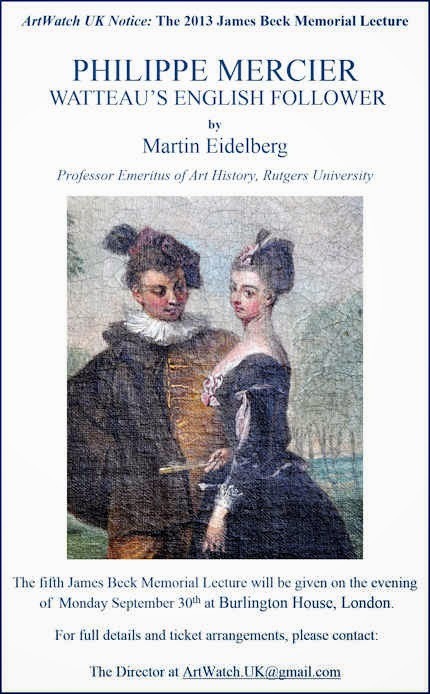 The initial premise rested on an arithmetical calculation: exhibitions of international character are presented by only 300 institutions out of 30,000 European museums. 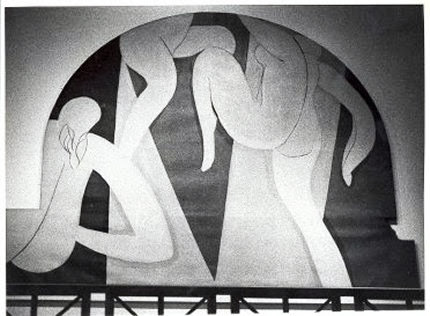 Recommendations were issued to stimulate exchanges and loans of works of art within Europe, in addition to existing international travelling exhibitions. Apart from administrative simplifications, it was seen that the best means of encouraging loans lay in a reduction of costs. With insurance charges comprising on average 15% -20% of travelling exhibition budgets, savings in this area could be achieved by four means: by museums’ extended use of the non-insurance of cultural objects; by waiving certain risks; by waiving costs of depreciation; and by expanding the use of State guarantees. In the latter, a State takes the responsibility of an insurer, at almost no cost to museums, for the largest part of the values engaged in the exhibition, loan, etc. The minimal part not guaranteed by states, or the “excess” part, is insured by private companies that remain responsible for covering “the first losses”. These are the more frequent and the most tangible (and not having covered these liabilities is the reason why States have had little to pay for damages up to now – which does not mean that accidents had not happened). 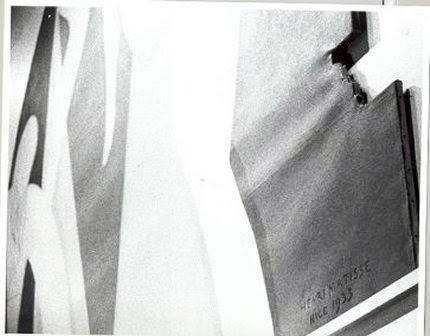 It should, however, be recognised that even commercial insurance does not cover all injuries: damages that are not discovered and declared within 48 hours are excluded: the universal rule of “nail to nail” further excludes any deteriorations that manifest themselves sometime after the return of a work. Nor does insurance always cover damages linked to the fragility of an art work in the environment of travel and exhibition as with regard to humidity, temperature, etc. The reasoning is that so-vulnerable art should not have been given permission to travel in the first place, and that the lender erred in permitting it. “Pre-existing fragilities” are specifically a possible exclusion argument. However, these companies do maintain in the process their strong concern with security risks. “Insurance costs serve as obstacles for projects that are doubtful in terms of conservation, for the reason that insurers are not willing to cover particularly high risks. From this point of view, insurance costs are a guarantee against ill-considered exhibition projects. 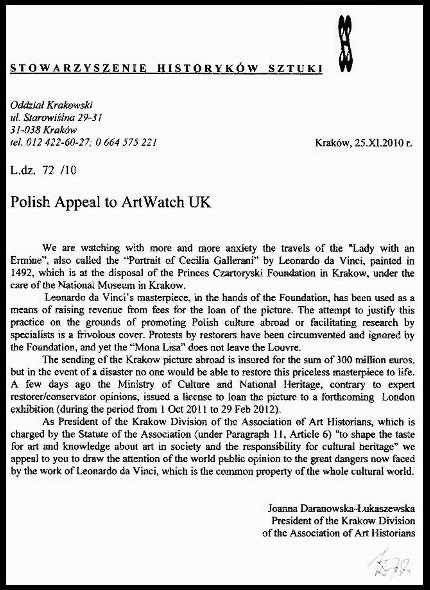 […] Insurance companies have an influence on security measures taken in museums, thus helping prevent damage” [See endnote1]. The purpose of the question is baffling: in 1991 the art insurer Hiscox stated that the risks involved were ten times higher for work on loan than when left at home. Sixteen years later, in 2007, in answer to our questions, Axa Art in France estimated the risks in loan venues to be about six times higher than in permanent residences. Specific European suggestions that lenders should: “not insure works while they [are] at the exhibition venue” ignore the fact that most injuries occur during the time of the exhibition – and especially at moments of handling: mounting/dismounting, unpacking/repacking. In addition to which, environmental stress and risks have sometimes proved higher during exhibitions than during the travelling time. The admonition to “waive depreciation” means that lenders should relinquish the loss of value after damage. This is a rationale from a mere financial strategy: mathematically, costs of depreciation comprise 80% of the money paid back by art insurance companies. But for ethical and cultural commitments, this strategy is most shocking. Apart from “money value”, waiving depreciation means to ignore, to deny the irreversible loss to the artistic integrity of the work of art when damaged. This rationale that an injured and then restored work has returned to its non-injured condition – or has returned “enough” to be “re-used”– is not only clearly fallacious, but represents a major fault in museum and conservation ethics. Because restorations may (temporarily) deceive the eyes of the uninformed, restoration is presented as a miraculous mean for wiping off responsibility and liabilities. 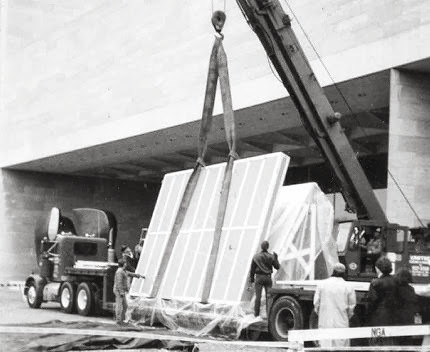 So, too, may “restorations” that are unnecessary for a work of art in its location, be imposed in order “to enable it to travel”, to endure the constraint of transport and the stress of alien environments. Such thinking might rightly be considered a source of abusive treatments of art objects: because of hasty intervention to meet deadlines or because of losses of their integrity (i.e. by relinings). But EU papers only address this question in terms of financial charges – which are to be kept “to a minimum”. 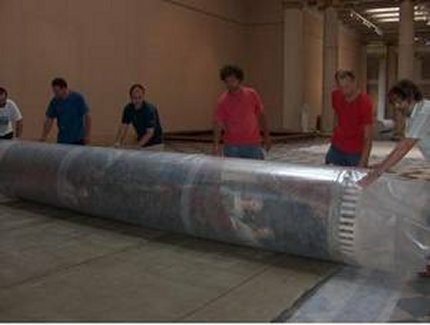 The “Museum collections on the move workshop” in Naples 2003 advised lenders to “limit as far as possible” extra expenses, and to think twice before asking for accompaniment by a courier , although this has proved to be the most effective procedure to secure the object during its whole travel. All the opposite – increasing the security and safety measures – should have been a central preoccupation of this European project, because, wishing to have more loans and more exhibitions (than those already conducted by the 300 major museums) would, necessarily mean involving a lot of small museums – which are less equipped – and borrowing art works from non-museum sources (i.e. city-owned or various communities collections). 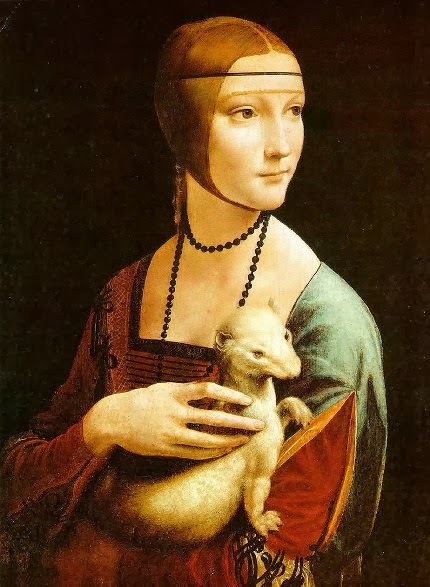 It is well known that when the lender is not an informed professional and is not well advised by a professional conservation team, his work of art would not likely receive the safest (more expensive) forms of care and protection. The tragically recurrent abuses of Signac’s largest painting should serve as a reminder. (See illustration and comments, right.) It should therefore be a priority to promote a reinforced ethical responsibility of the borrower, to protect the “little” lenders. Specifically to be excluded should be loans assembled for the purpose of festivities, political celebrations, personal or group promotions, etc. European institutions might themselves be supposed to set a “best practice” example in this regard. 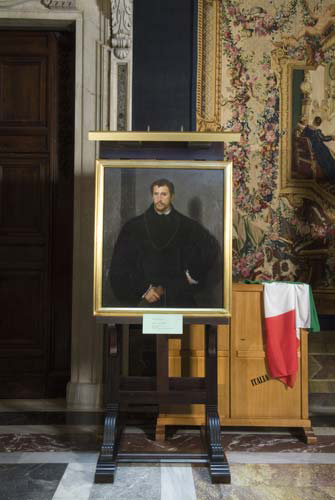 How then, on what academic, artistic or scientific reasons, were the 27 nation members of the European Union asked to send “a treasure of their cultural heritage”, to be gathered in a single (over-crowded) room of the Palazzo Quirinal in Rome (from March 24th to May 20th 2007) in order to celebrate the 50th anniversary of the Treaty of Rome? (3) The role of the courier is to act as representative of the lender in ensuring safe handling of the loan during transit, unpacking, packing and, if necessary, during installation and de-installation. Moreover, he would need the presence of an accredited supervisor (extra expense) to look after the loan all the way along to the plane holds on airport freight zones. (4) General Principles on the Administration of Loans and Exchange of Works of Art between Institutions, Code of practice of the international group of organisers of large-scale exhibitions (Bizot Group). Above: This 14th century polychrome sculpture of Saint-Bernard could serve as a memento, mentioned in R.H.Marijnissen and L. Kockaert excellent book Dialogue avec l’oeuvre ravagée après 250 ans de restauration (Fonds Mercator, 1995). 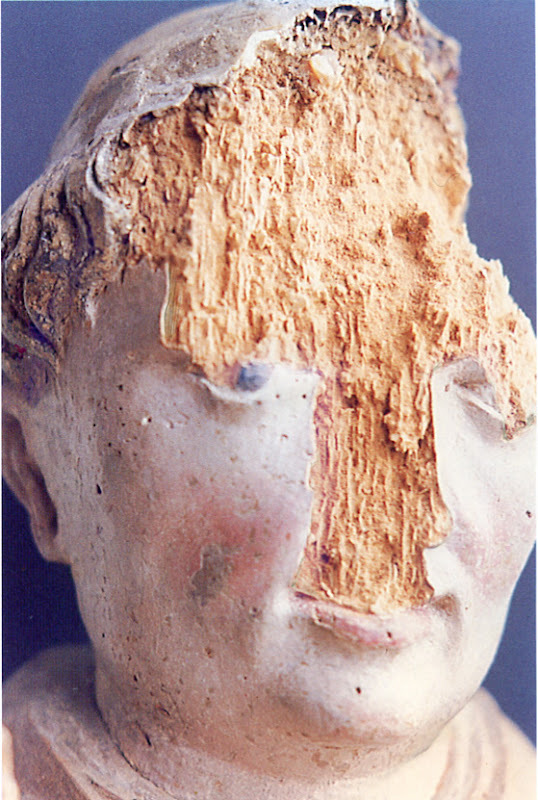 During the Benedictus Pater Europae exhibition (Gand 1981) the statue was knocked over, with the resulting loss of the major part of its face. Obviously it was not as safe as at home. Insurers argued for “pre-existing fragilities”. Anyway, no miraculous restoration could solve the problem. 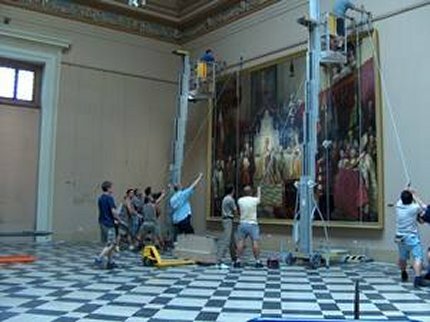 In 2005 the Royal Flemish Academy of Belgium for Science and the Arts – Fine Arts Group, of which R. H. Marijnissen is member, issued a collective statement – “Moving Art” – that expressed their growing concern over ethically dubious art shows and the associated risks involved for collections. Flemish, French, English and German versions of this statement are to be found in Soigner les Chefs-d’œuvres au pays de Magritte, R.H.Marijnissen , Le Livre Timperman, Bruxelles 2006. 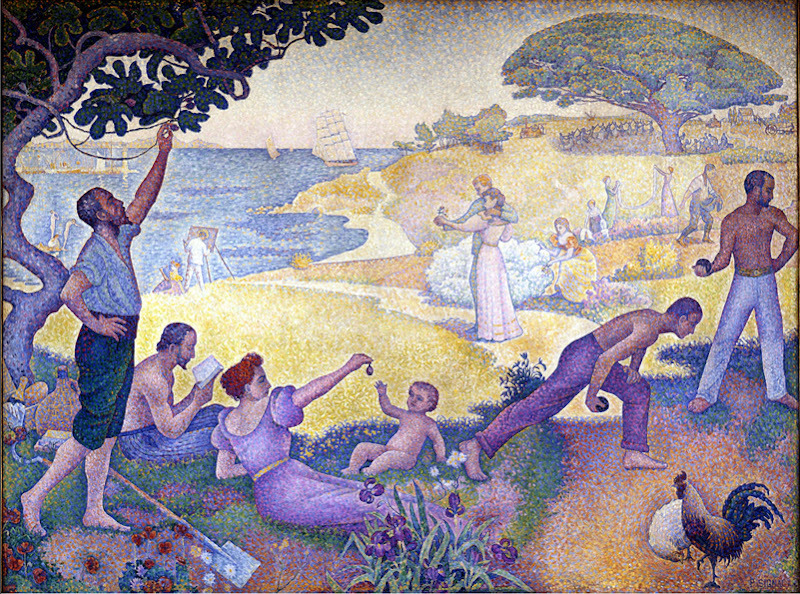 Above: Au temps de l’Harmonie is the largest picture (311 x 410 cm) ever painted by Signac (in 1894-95) and was offered by his widow to the City of Montreuil. Kept in the Hall of the city-house, it remained for a century in a pristine condition and exceptional integrity, with no relining, no retouches, etc. In 1992, for the first time, it was borrowed for a Signac exhibition in Reims, where it arrived ripped “in many places […] the largest tear (70 cm) threatening to extend all along the border […] where other rips are in progress”. 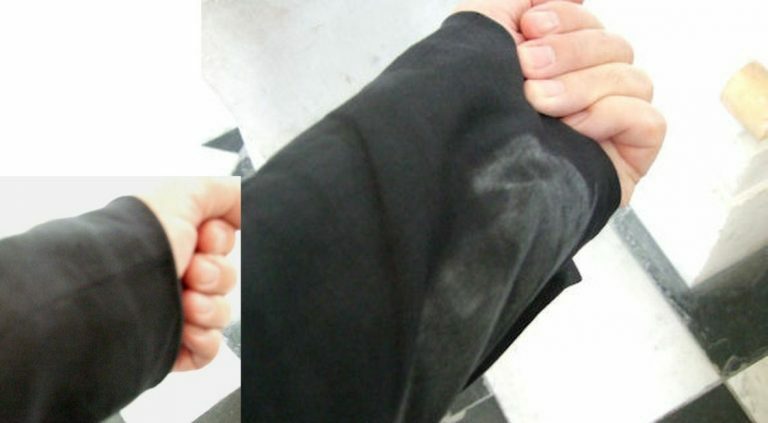 The tears were consolidated wisely, in order to avoid the trauma of a total relining. 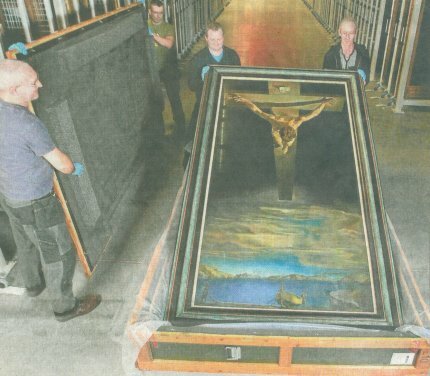 The Inspector of Historical Monuments urged “to keep the painting where it is and not to attempt to have it sent again in various exhibitions”. 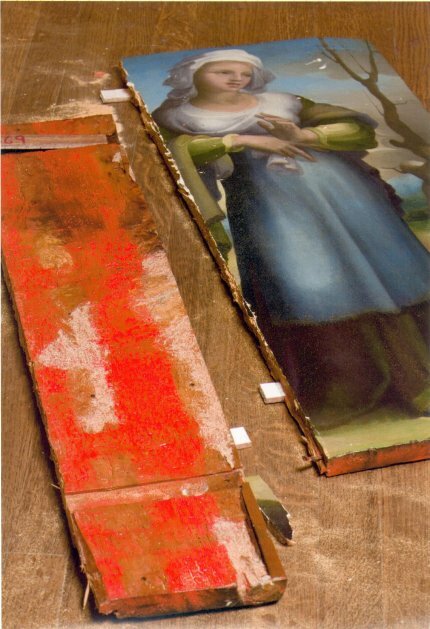 This was a waste of advice: the painting, although extremely fragile and large, was sent in 1997 to an exhibition in Paris… where it again arrived ripped, without any understanding of “how and when a shock could have hurt the painting while all the precautions have been taken [sic]”. Who is to blame? The too-confident small city of Montreuil? Or, the self-confident Paris exhibition organizers – who might have declined the loan in view of the painting’s well-known fragility? 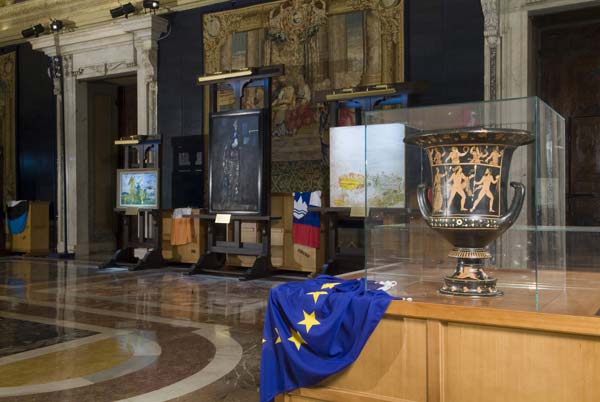 Above: Masterpieces loaned by the 27 nation members of the European Union when asked to send “a treasure of their cultural heritage” to be (so poorly !) 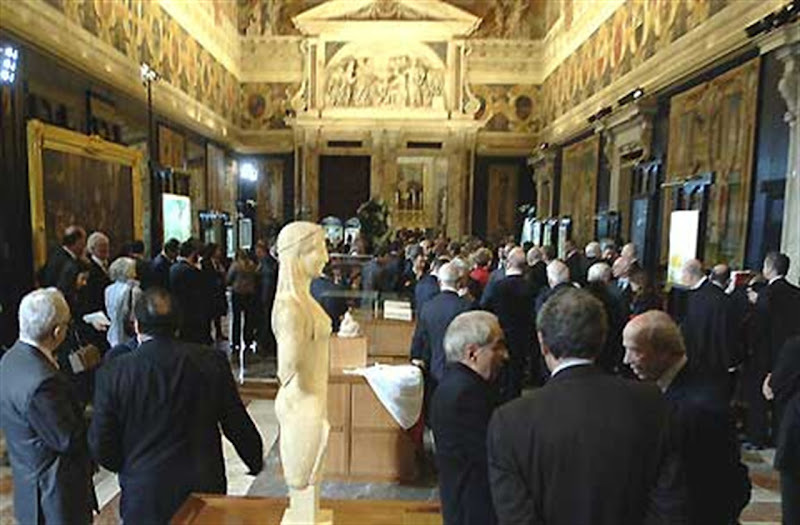 disposed in a room of the Palazzo Quirinal in Rome (from March 23rd to May 20th 2007) in order to celebrate the 50th anniversary of the Treaty of Rome. Among them, The Thinker by Rodin seems rather puzzled.